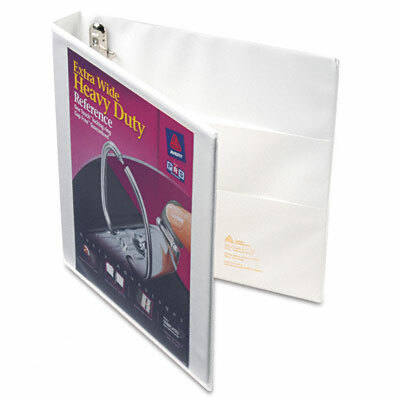 Extra-wide cover for use with top-loading sheet protectors and extra-wide dividers. Nonstick, archival-safe material won't lift ink or toner off of printed pages. Easy Insert™ feature helps you place and remove personalized spine inserts quickly and easily. Four inside pockets store unbound materials for improved organization. Extra-wide cover for use with top-loading sheet protectors and extra-wide dividers. Crystal clear overlay enhances custom inserts on front cover, back cover and spine. Nonstick, archival-safe material won't lift ink or toner off of printed pages. One Touch™ mechanism lets you open, close and lock your binder in one easy step. Easy Insert™ feature helps you place and remove personalized spine inserts quickly and easily. Gap Free™ feature prevents ring misalignment so pages turn smoothly. Locking EZD® Ring holds up to 50% more than same size round rings (20% more than slant rings). Back-mounted rings allow pages to lie flat. Four inside pockets store unbound materials for improved organization. Exposed rivets on spine.